ACCORDING TO a medieval Irish legend, there once was a Celtic prince named Cenn Fáelad (“kwenn FAY-lad”) who suffered a serious injury to his “brain of forgetfulness” in battle. From that day on, he could never forget anything. The legend continues that in the abbey where the prince was sent to recover from his war wounds, there were three schools—one of Latin learning, one of Irish law, and one of traditional Celtic poetry. During the day, he would wander from one school to another, listening to lectures from outside their windows. At night in his room, unable to forget the three lessons, he would weave them together into a single narrative. 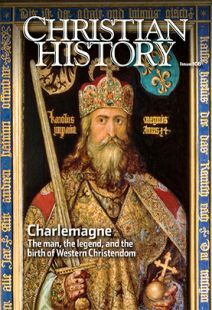 While this tale is fictional, it gives an apt description of what was going on in Irish monasteries during the early Middle Ages and why Celtic monks were the perfect educators for Charlemagne’s court. In between sessions of harsh ascetic discipline and service to God and community, Irish monks were painstakingly copying classical and Christian Latin texts for posterity (like the Book of Kells). But they were also faithfully preserving traditional Irish laws and ancient Celtic legends—through a Christian lens, but exercising very little censorship in the process. This is precisely what Charlemagne wanted for his schools. He envisioned monks-in-training meditating on a reliable Bible, palace libraries filled with Christian doctrine and history, and students reading Cicero and studying the stars. But he also wanted a literate class who could preserve the laws and legends of his heritage—all things in which the Irish excelled. So one by one, Irish scholars, bards, and scientists were recruited to serve in Charlemagne’s court, leading his intellectual reform. The bane of Cenn Fáelad—learning something about everything—would become the defining characteristic of Frankish education.